A worker of the Bombus lucorum species with lemon-yellow bands. 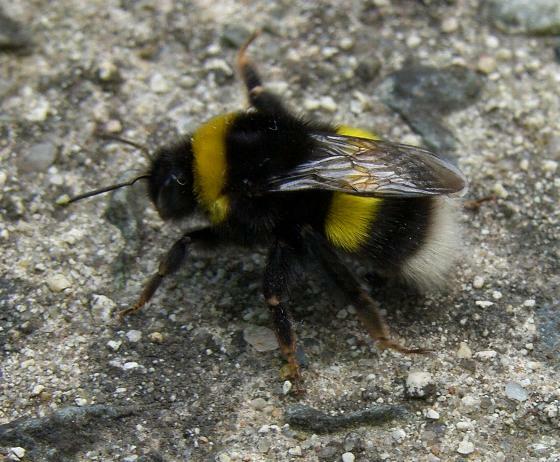 The Buff-tailed Bumblebee is the largest species of bee found in the British Isles. There are about 19 species which can be identified from markings, mouth parts and body size, eg. the Bombus terrestris queen has orangy-yellow hairs at the end of its abdomen, whereas B. lucorum has lemon-yellow hairs (worker bees of both species have identical white hairs and are difficult to tell apart). Pollination of plants by insects is essential for their continuation and to feed the world, and although many would think of Honeybees doing this, they are greatly outnumbered by Bumblebees, Solitary bees and other flying insects. Their ability to sting is of concern to most people, but they are not as aggressive as honey-bees, preferring to fly away from danger, and the drones (males) do not have a sting at all. They will only sting under duress and as the sting does not have any barbs it is not lost and they do not die as a result (as with Honeybees). There is an urban myth which arose from a mistaken aerodynamic calculation that theoretically a Bumblebee should not be able to fly if the area of the wing is compared to the size and weight. This is inaccurate because the wings make a figure-of-eight motion and beat very fast so the vortices created give enough lift for flight. The buzzing sound is caused by air being forced through holes in the abdomen as the wings are flapping. Another trick they can perform is to dislocate the muscles from the wings and exercise the muscles to generate heat, so they are one of only a few insects that can regulate their body temperature. This allows them to warm up in cooler weather and can seek out nectar when other insects are not around. The nectar in their bodies behaves as anti-freeze allowing them to tolerate freezing temperatures. They gather nectar in their honeystomachs which occupies holds between 0.06 and 0.20 mls occupying up to 95% of the space in the abdomen when full. Some of the nectar can pass into the digestive system and depending on the amount of flying required to collect it the remainder is carried back to the nest to feed the queen and larvae. The miniturisation of electronic technology has produced microscopic surveillance equipment which it is proposed can be attached to bees so that they can collect data about the environment as they carry out their daily routine. At only about 100 milligrams the device would not be a burden to the bee and the data would be useful for research and to the agriculture industry to monitor conditions among crops to indicate if intervention is needed. They live in colonies of up to 150, but only fertilised young queens survive the winter as they do not make enough honey to see all of them through the cold season. In March as the weather warms up the queen emerges to start a new colony in a vacant mouse nest or a dry hedgerow bank. She lays about six eggs in a ball of nectar and wax, adding to it as the hatched grubs feed and grow. These emerge as workers (females) a few days later, they begin to collect pollen and nectar to feed the grubs of the eggs the queen continues to lay. At the height of summer the nest is about 120mm in diameter and the queen begins to lay eggs which will become drones (males) and new queens for the next year. The drones leave the nest to live independently while looking for a queen to fertilize. At the first frosts the old queen, workers and drones are killed, only the fertilized new queens find a sheltered spot to hibernate. Bumblebees require a supply of pollen and nectar from spring to autumn so a succession of flowering plants in the garden will help them through their year. Primulas, heathers and flowering currant make an early supply. They prefer a warm south-facing, sheltered spot to nest; a clump of twigs and dry leaves or an upturned pot with dry hay or straw in it would provide suitable shelter. An old teapot, buried with the spout exposed in a downward position, is one way to provide a nesting site. For hibernation a dry, north-facing position is best as an early sunny day may encourage the queen to emerge too soon, only to be killed by the frost. With warmer winters now ocurring regularly, some Bumblebees are no longer hibernating, obtaining nectar from ivy and other winter flowers. The Neonicotinoid insecticides have been implicated as possible causes of the reduction in the numbers of bumblebees and other pollinating insects. The numbers had begun to decrease before the introduction of these chemicals so the tendency towards monocultures in agriculture has also been suggested. Even if a crop provides pollen and nectar there will be none when it matures. As many weeds and hedgerows have been cleared away to increase productivity the pollinators can starve. Recent research at Royal Holloway University of London has found that two diseases of domestic bees are spreading to the wild bees. The the single-cell parasite Nosema ceranae and the deformed wing virus are affecting wild bumblebees in England, Scotland and Wales, so are another factor to their decline in numbers. The researchers found that about 11% of bumblebees were infected with the deformed wing virus and 7% had the Nosema parasite. In spring 2013 the EU placed restrictions on the use of some named neonicotinoids, including Imidacloprid, for two years.